Hello Steemians and Partiko lovers! We have another good news for you! We have prepared another full pack of gifts for you! A chance to win Partiko swags (jackets, notebooks, tote bags and pens)! How to unlock the gift? The voting contest above is to compete for a 20K delegation for one year. 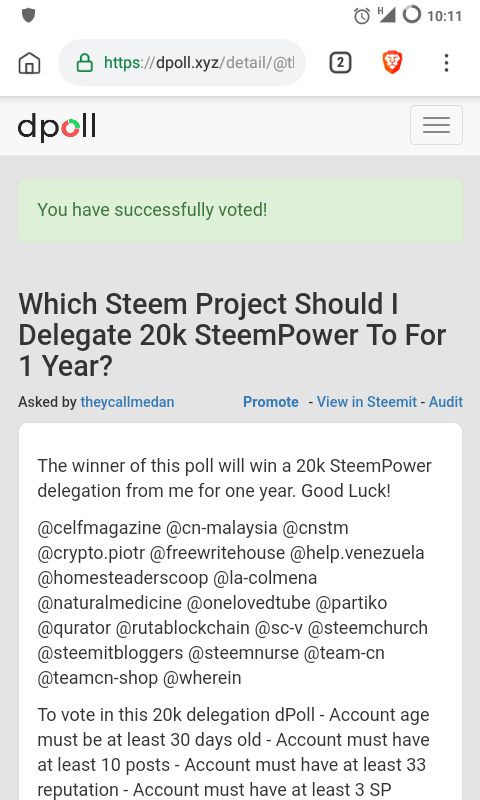 If Partiko wins, we will delegate 5 Steem Power to every active Partiko user who have voted for us and resteemed this post, for life! Everyone (no conditions attached) can get 500 Partiko Points for voting for us and resteeming this post! Partiko Points can be converted into Steem token! We will select winners from people who have voted for us and resteemed this post, and send them Partiko swags (Partiko doesn't have to win the voting contest)! If more than 100 people voted for us and resteemed this post, we will select 1 winner. If more than 200 people voted for us and resteemed this post, we will select 2 winners. If more than 300 people voted for us and resteemed this post, we will select 3 winners. If more than 400 people voted for us and resteemed this post, we will select 4 winners. We will ship the swags as long as your address is shippable on planet earth. 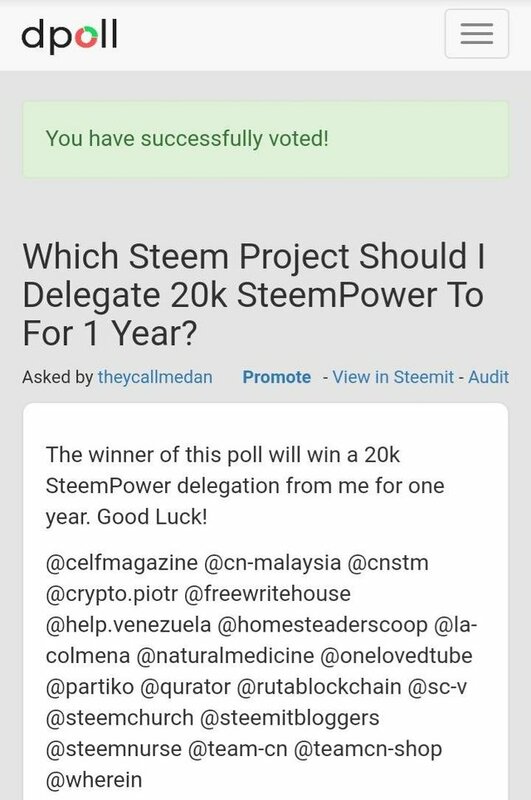 Partiko Points and Steem Power delegation will be sent after the contest has finished and @partiko has received the 20K Steem Power delegation (if Partiko wins). The Partiko swags will be shipped within a month! Read this article if you want to vote for us but don't know how. And Partiko Points can be converted into Steem token! Partiko sends spam. Account replays with 'stop' to opt-out of receiving more spam. 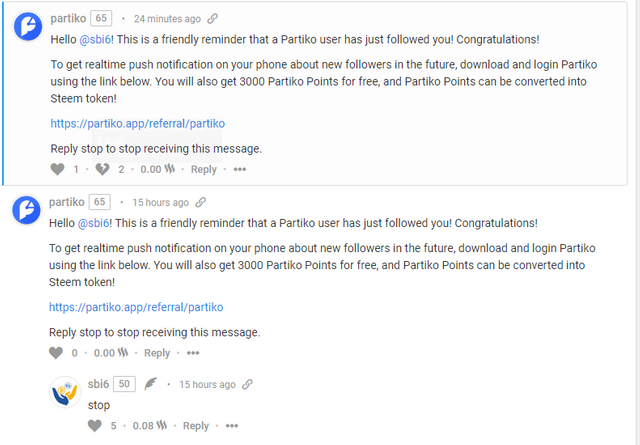 Fifteen hours later, partiko sends the same spam again. @partiko, you should STOP the spam entirely until you can evaluate the impact this is having on your public image - or at the very least until after you can fix your opt-out process. I looked at your account on steemworld and you have dozens of downvotes just today. It appears very likely that this illegal spamming behavior will completely destroy your reputation on Steem. Sorry this is a bug. We will fix it. You know that Steem has a testnet, right? If you are going to release code that puts you in violation of the law in your home jurisdiction, maybe you should test the code before sending 24000 spam messages with it? Thanks, I dont feel lonely any more ! No worries at all! Just have fun! Just discovered Partiko! So far, I like it a lot!!! Easy to switch between accounts too, with steemconnect... Recommended! So you are just basically buying the contest! 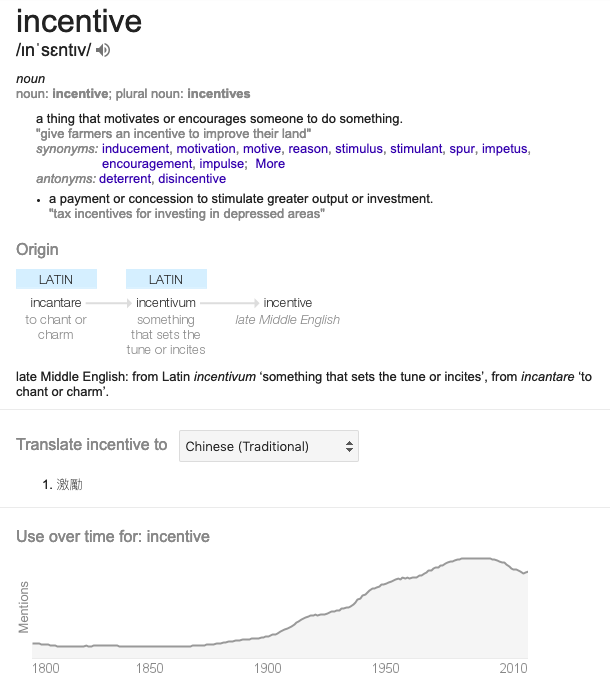 I'm not native English, but I think would be better you use the word "incentive": everyone has an interest, participating in the poll... or am I wrong? Partiko will be PAYING in tokens and delegations votes received. I have done my part, not here to start a war just hoping they review their ways and work in a more ethical fashion and also stop the spamming. At least remove me from their spam list. No, i am not related to him i appreciate the votes, i dont receive them to promote him or his deeds thanks for the interest. I think you have to vote on dpoll, not upvote this post. All done. Long live Partiko! Habe @partiko als Zeuge gewählt und diesen Beitrag geresteemed! My profile picture doesn’t change in the partiko app? Could you help with that? STEEM SUPPORT ADDED! Convert STEEM to 140+ cryptocurrencies instantly! Love you partiko. Hope we will be the winner of the amazing contest. Done it & I hope partiko will get maximum votes. Haha. I already voted you guys for witness! All the best in the poll! Damn! Too late! I already voted. As long as you resteem, you will still be counted! Good luck! Just voted you. I like Partiko so much. I hope it gets improved consistently with more SP. Resteemed too. Thanks. Partiko is so alive. Glad they trying to get that delegation. But already voted for #2 on the list. Yes voted for partiko..... as well resteemed...partiko is love. Vote for @partiko and resteem this pist were done. Resteem and vote for partiko were done. Resteemed and voted for you..
Hello! Which gift are you asking? Thanks! In this post we mentioned three gifts in the pack. Which one were you referring to? Thanks! 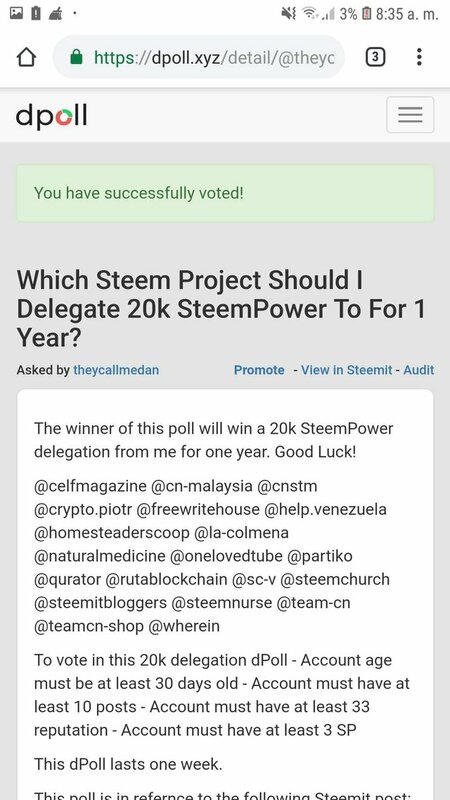 Thank you for your supporting and kindness to get improve for all on steem platform.I followed and voted for partiko's witness.I upvoted and resteemed this post also.Good luck to you all. Voted thru dpoll, resteemed this post for my first time over @partioko, leave a 5 stars comment on apps store and gonna make my 1st post on @partiko!! 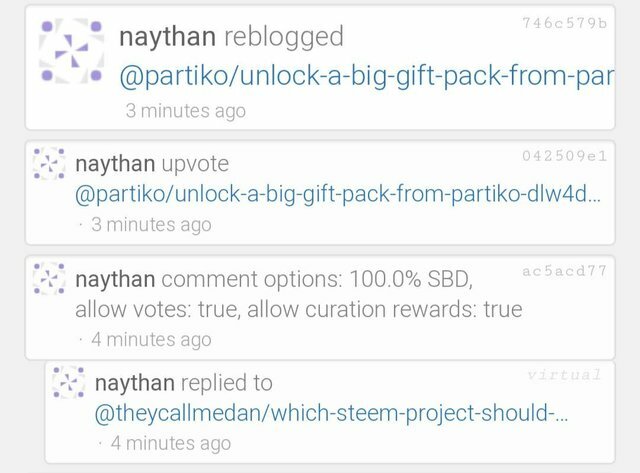 I believe @partiko is the best apps for Steemit and STEEM! You guys Really need a great push for the awesome job you are doing on a daily-basis. I voted for you and resteemed your post. I hope this helps. Voted and resteemed. Thanks for your good work. You know I love you Partiko! Voted and resteemed! Voted and resteemed. Even voted for your Witness. Voted/resteemed best of luck everyone! How do we get a Partiko referral link to invite friends? @partiko, I told you that you’re my best friend? Resteemed! Done, @partiko is the best #steem Dapp you can earn even if you don't earn. Take Action! Show your LOVE by voting for Partiko! Voted, resteemed and voted for Partiko witness. Voted and resteemed. Good luck! Resteemed and voted- good luck! Voted and resteemed, good luck @partiko and to all the participants for the swag. Yes my friend febret partiko I resteem this post. I am trying my luck. You guys are amazing. Helping both new and old steemians. Thank you! Voted and resteemed. Thanks for the opportunity. This is great !! Good luck everyone ! 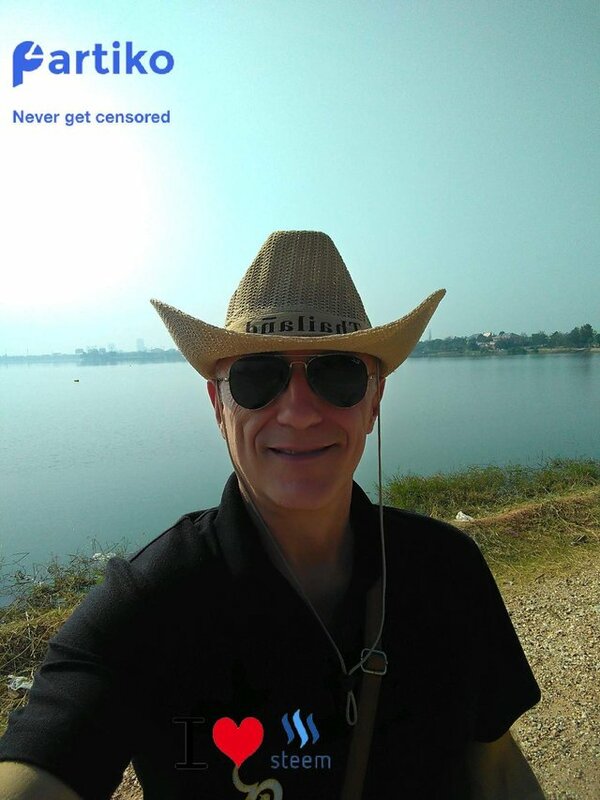 I have to support my favorite Steem app! Voted @Partiko for 20k SP!